In yet another truly dramatic 13th round of the FIDE World Chess Candidates' Tournament Magnus Carlsen (Norway) caught Vladimir Kramnik (Russia) in first place. Carlsen, who ground down Teimour Radjabov (Azerbaijan) in 89 moves, is now first on tie-break because of his higher number of wins. Kramnik had a promising position against Boris Gelfand (Israel) but couldn't get more than a draw. Alexander Grischuk (Russia) and Levon Aronian (Armenia) drew as well, while Vassily Ivanchuk (Ukraine) lost yet another game on time against Peter Svidler (Russia). In the 13th round “giant killer” Vassily Ivanchuk returned to his bad habit in this tournament of handling the clock terribly. It’s hard to believe but it’s true: the Ukrainian overstepped the time limit for the fifth time. It must be said that this time his position was lost. “It was a new experience for me. When he played 27…Rd7 he looked away, and after I played 28.a4 and pressed the clock, he lost about half a minute trying to figure out which move I made,” said Svidler. Moving on to the two key games of the round, Vladimir Kramnik and Boris Gelfand were the first to finish. This encounter started as a Fianchetto Grünfeld and the former World Champion came up with a new idea as early as move five – something that’s very rare in chess. “It’s amazing how many ideas he’s introducing, maybe more than all of us together!” said Gelfand. “At least I got a game, I got a game,” said Kramnik, who needed to keep all options open: going for a solid draw or playing for a win, depending on the developments in Radjabov-Carlsen. After move 17 White seemed to have nice pressure and with giving up his dark-squared bishop Black appeared to be walking a tightrope. Kramnik: “One little mistake and everything starts to collapse!” About the position after 21.Qd3 he said: “Black cannot even create a threat. I think I’m clearly better, strangely enough.” The critical moment of this game was perhaps at move 30 where with little time on the clock Kramnik might have missed a stronger continuation. But, throughout the game Gelfand defended fantastically, and the Israeli fully deserved the half point he got. For Magnus Carlsen the big question was how he would cope with what was his first loss since September last year. According to commentator IM Lawrence Trent the Norwegian’s strategy was basically “not to go crazy”. Against Teimour Radjabov, Carlsen played a rare line of the Nimzo-Indian in which he had to give up the bishop pair at an early stage. With simple developing moves Radjabov got a slight edge, but the Azerbaijani missed a tactic and Carlsen grabbed the initiative. Avoiding further mistakes, Radjabov managed to reach an ending that was only slightly worse for him, and which should have led to a draw. However, as he has down so often lately, Carlsen just kept on trying and trying and eventually, after 89 moves, he managed to “squeeze water from a stone”, as one chess fan put it, and win the ending. Knowing that he was leading the tournament again, Carlsen entered the press room relieved and excited, doing a joyous and explosive high-five with his manager Espen Agdestein. After thirteen rounds Carlsen is tied for first place with Kramnik. Both have 8.5 points, but the Norwegian has a higher number of wins. This means that Kramnik needs to outperform Carlsen in the last round to win the tournament. Aronian and Svidler are shared third with 7 points, Grischuk and Gelfand shared fifth with 6 points, Ivanchuk is seventh with 5 points and Radjabov is in last place with 4 points. The 14th round and final round will be played on Monday, April 1st at 14:00 BST with the games Carlsen-Svidler, Ivanchuk-Kramnik, Gelfand-Grischuk and Aronian-Radjabov. In what was a truly dramatic round, for the first time all games went beyond move 40. Boris Gelfand and Peter Svidler, however, agreed to a draw immediately after the time control. Gelfand was happy with his position out of the opening, an Anti-Grünfeld. He said he knew that it’s “difficult to defend for Black”. Svidler agreed: “It’s a structure I’m not comfortable playing.” Making matters worse with the inaccurate 20…Red8 and 21…Bg7, Svidler was looking at an unpleasant position around move 30. “I’m kind of running out of moves. To call it a Zugzwang position is an overstatement but it’s very difficult for me to make moves.” Gelfand, however, missed a tactic with his 32nd move (he should have played 32.Qb3) when the worst was over for Black. “I thought I was winning a piece,” said the Israeli grandmaster. On move 16 the game became extremely sharp, and every move was crucial. As became clear at the press conference, the players evaluated the position after 17.Rc5 quite differently. Aronian: “Honestly speaking I thought I was close to winning.” Kramnik: “Really? I thought I was close to winning!” The Armenian actually saw the line 21.Rh5 Rac8 22.Ne5 which draws (missed by Kramnik) but thought he had more. In that phase, according to some pundits Aronian “self-destructed”. Kramnik then missed the strongest continuation (21…Qf4). Instead he went for a promising ending, which he said was “technically winning of course”. However, by exchanging rooks at the right moment, Aronian found a way to draw it, based on the fact that he could exchange all the pawns on the kingside after which Black would end up with a bishop of the wrong colour. This was a “cold shower” for Kramnik, who said it was “a miracle” that he still had a chance to play for a win with 41…Kf8. And then, after seven hours of play, the chess world was shocked as Magnus Carlsen lost his first game of the tournament, and with it his lead in the tournament. But if anyone could beat him it was the erratic Vassily Ivanchuk, who had the upper hand in their first mutual game as well. In a Taimanov Sicilian, the Ukrainian quickly got a pleasant ending. “When 10.Nb3 appeared on the board I understood that this structure resembles the French Defence and it’s interesting to play. Objectively it’s not better for him but there were many tricks and traps,” said Ivanchuk. Quite upset about his loss, Carlsen did attend the press conference and was very critical of his play. “First of all I think I played absolutely disgracefully from move 1.” He admitted that it was Black who had an edge in the ending, but after the weakening move 18…a5 he started to play for a win again. But then his 24.Nb5 was "extremely stupid”. “I can do anything. Probably I'm actually not better but I should never lose it.” About the position after move 30, the Norwegian said: “I think there's still not too many problems for me but I just kept on missing more and more stuff.”Ivanchuk kept pressing, but even the rook ending should have ended in a draw, e.g. with 71.c6. However, there Carlsen made the decisive mistake: “Here I was actually pretty sure that I would draw, which is why I played so carelessly. I hadn’t seen 71…Ke4 at all.” Although he wasn’t sure about his technique, Ivanchuk didn’t make a single mistake, converted the full point and made Kramnik the new sole leader. After twelve rounds the standings are as follows: Kramnik leads with 8 points, followed by Carlsen with 7.5. Aronian is third with 6.5 points and Svidler fourth with 6. Grischuk and Gelfand are tied for fifth place with 5.5 points, Ivanchuk has 5 and Radjabov 4 points. Saturday, March 30th is a rest day. After the clock is set one hour forward, the 13th round will be played on Sunday, March 31st at 14:00 British Summer Time (BST) with the games Radjabov-Carlsen, Grischuk-Aronian, Kramnik-Gelfand and Svidler-Ivanchuk. The first reserve for any replacement needed is Lagno, Kateryna (by rating 2546.33, average 9 lists Mar 2012 to Jan 2013). 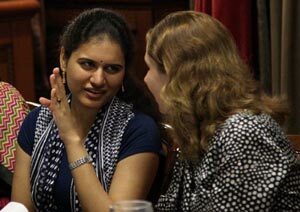 The full regulations of the Women's Grand-Prix 2013-2014 are published in the Fide handbook. FIDE and Renova Group of Companies have announced the third leg of the Chess Grand Prix series to take place from April 17 to May 1 in Zug, Switzerland. Fide has announced that they are finalising negotiations with the hotel and would inform all participants of the hotel arrangements and any extra charges for accompanying persons in the next two days. 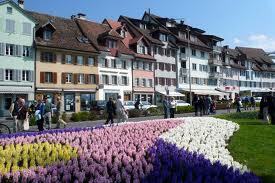 Zug is located around 25 kilometers from Zurich Airport and the best connection is via train. FIDE is currently also working on a replacement organiser for the fourth leg and more information will be available shortly. The dates of the fourth leg will also remain the same as scheduled in the calendar. In Thursday's 11th round of the FIDE World Chess Candidates' Tournament 2013 Vladimir Kramnik moved to second place. Russia's number one beat Teimour Radjabov (Azerbaijan), while Levon Aronian (Armenia) lost to Peter Svidler (Russia). Drawing his black game with Alexander Grischuk (Russia), Magnus Carlsen (Norway) kept his half point lead in London with three rounds to go. Vassily Ivanchuk (Ukraine) and Boris Gelfand (Israel) played a very quick draw. Designed by world-renowned Pentagram Design, the playing zone in the IET’s Lecture Theatre has a lower middle area and a higher area at the back. It is there where the arbiters stay and where the players are getting their food and drinks during the game. As became clear at the start of the 11th round, chess players aren’t really used to such a split-level room. Vassily Ivanchuk slipped and almost fell down, hurt his left ankle and had to treat it with some ice. (Now he’s fine.) At the press conference his opponent, Boris Gelfand, said that he too almost fell down in one of the previous rounds, plunged in thought about his position! Magnus Carlsen kept his half point lead in Round 10 of the FIDE Candidates’ Tournament in London. On Wednesday the Norwegian ground down Boris Gelfand (Israel) with White in a Rossolimo Sicilian. His main rivals also won: Vladimir Kramnik (Russia) admitted that he was lucky as in a drawish Berlin Endgame Alexander Grischuk (Russia) blundered in time trouble, while the opponent of Levon Aronian (Armenia), Vassily Ivanchuk (Ukraine), overstepped the time limit for the fourth time in this tournament, after playing well in a Budapest Gambit. Dejected about his score with White so far, Teimour Radjabov (Azerbaijan) went for a quick draw against Peter Svidler (Russia) in a Grünfeld. An hour and a half into the 10th round, the game between Teimour Radjabov and Peter Svidler was already over. It’s about time to quote commentator Nigel Short’s description of such games: it was a damp squib. Having repaired his Grünfeld after his loss against Kramnik (“It wasn’t that broken, to be honest” – Svidler), the Russian grandmaster again went for his favourite defence but his opponent did manage to surprise him with his 16th move. This “either caught me by surprise or I simply couldn’t remember what my notes say,” commented Svidler, who continued playing sensible moves. Vassily Ivanchuk was also bringing back memories, but of a totally different kind. Against Levon Aronian the Ukrainian overstepped the time limit, for the fourth time already this tournament. By now we just have to mention German grandmaster Fritz Sämisch (1896-1975), who at the age of 73 played two tournaments, one in Büsum, Germany and another in Linköping, Sweden, where he lost all games (fifteen in the former and thirteen in the latter) on time. Magnus Carlsen then became the third winner of the day, slowly grinding down Boris Gelfand from a Rossolimo Sicilian. According to the Norwegian, after the opening “White is slightly better but it's of course very playable for Black.” After some forced moves Gelfand went for the manoeuvre Qd8-b6-b3-c2 where computer engines prefer the passive 20…Qf8. 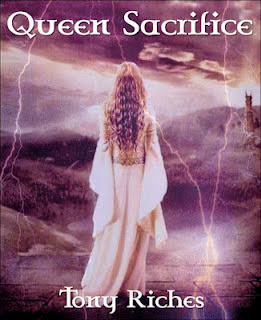 “What computers are missing is that the whole concept was to get the queen active and to keep the white pieces paralysed. 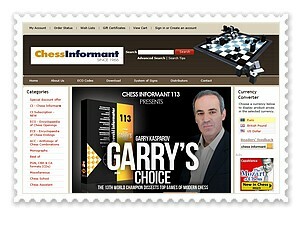 But I just missed one thing,” said Gelfand. That thing was a deep tactic which forced the Israeli to change his intended plan (Ra8-a1) and find something else at move 25. There were many ways to defend in that phase, and after the press conference Gelfand stayed around for about ten minutes, analysing blindfold with Jon Speelman and some journalists. 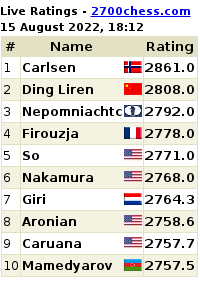 After ten rounds Carlsen is leading with 7 points. He’s followed by Aronian (6.5) and then Kramnik (6). Then there’s a gap with: Gelfand, Grischuk and Svidler who have 4.5 points. Ivanchuk and Radjabov are in last place with 3.5 points. On Thursday, March 28th at 14:00 GMT with the tenth round: Grischuk-Carlsen, Kramnik-Radjabov, Svidler-Aronian and Ivanchuk-Gelfand.